Every child has a story. For 7 million American children, having an incarcerated parent often results in school behavior and performance problems as well as social and institutional stigma and shame. Approximately half of children with incarcerated parents are under ten years old; a very high percentage of these children will end up in prison. One of the causes for this alarming impact is the lack of education. Approximately half of children with incarcerated parents are under ten years of age. A very high percentage of these children will end up in prison. One of the causes for this alarming statistic is the lack of education. According to figures from the Children’s Defense Fund, 1 out of every 8 school children will not graduate. This means that the population currently at risk of dropping out could be as many as 6,680,625 children. Several states know these stats very well and so they are building new prisons to create more beds to accommodate these children. Those are the facts of life for these families in America. As you can see, one of the chief factors in their lives is “lack of education.” Children who are at-risk have increased vulnerability in this area. Again, these stories are not meant to bring you just the shocking reality of what children are going through, but instead to call you to participate in helping them get over the hump. 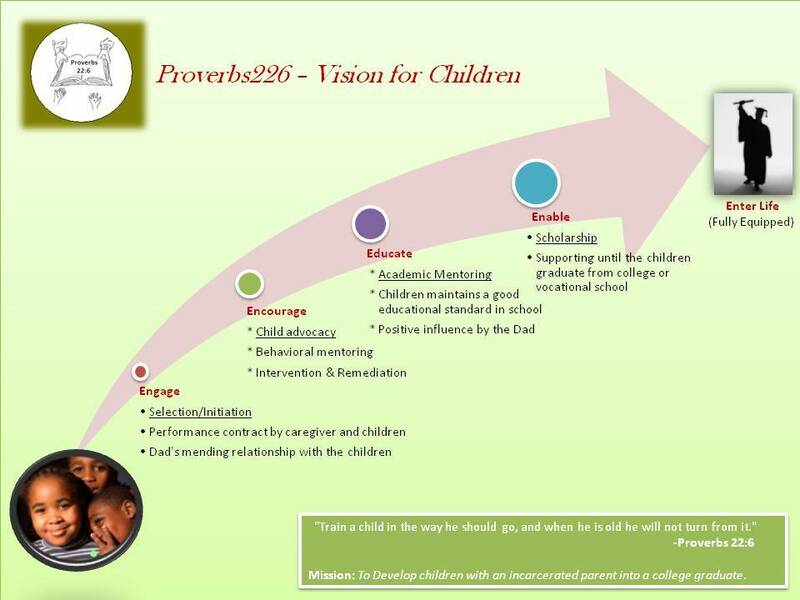 We have created a platform for children and their families through a ministry called Proverbs22:6. The title of this effort is derived from a Bible verse that is found in the book of Proverbs written by King Solomon. It says, “Train a child in the way he should go, and when he is old he will not turn from it.” (Proverbs 22:6). The mission is to: develop kids with an incarcerated parent into college graduates. Before starting Proverbs22:6, I had a chance to meet and talk with several of these mothers who are taking care of their children in the absence of their husbands. As you can see, their problem is not that they are giving up on their kids’ education, but they do need extra help to get them over the hump. Our vision can be condensed into two words, “Prison Takeover.” We want to start working with one prison at a time so we can make a difference in their lives. Instead of creating several different programs, it focuses on stopping kids from coming into the prison system. Create meaningful relationships with the dad or mom who is incarcerated in prison. Redefine their identity, and have them think about ethics and moral values, which will separate them from mediocrity. Raise the bar to high standards. As Sen. Hillary Clinton says in her book, It Takes a Village, we need to work as one team to change the paradigm they are in. We need the parents who are in prison to commit to making a difference in their children’s lives. Caregivers (whoever is taking care of the children) need to create a platform for the children to succeed in life by staying in school. Educators or academic mentors can help the children improve their grades in school and be the guiding forces to assist them in excelling on their educational paths. Finally, mentors or community leaders need to take the social responsibility to teach the children values and principles that they need to live by. Children, who are emotionally drained, faced with challenges, beaten and half-dead with no hope. The single moms, who makes gallant attempt to raise children in the midst of challenges. We are in search of missionaries who can mentor a child both emotional and with academic needs. If you are interested in being part of these children’s lives, we gladly welcome you to join us in serving these children. One of the things we have found is that children may not have enough school supplies, so we plan to provide school supplies and backpacks to help the children to be ready for the start of school. For more information on how you can be part of Proverbs22:6, please visit us at www.proverbs226.org or send us an e-mail to cyril@proverbs226.org. Without a compassionate people like you, the world will disintegrate and fall into chaos. I have been searching for an organization like yours for a few years. I was sure there must be something available. I have 3 grandchildren who’s father will be incarcerated for a large part of their childhood. My daughter works so hard to make their lives the best they can be!